Braunvieh means "brown cattle" in German. 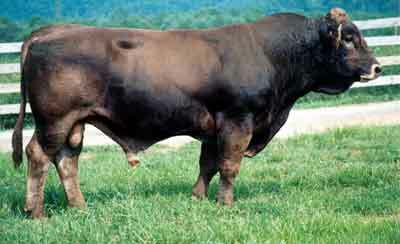 Brown cattle found in the mountains of Switzerland during the 17th century formed the basis for the modern Braunvieh. They are gaining recognition as a breed for moderate frame, calving ease, excellent disposition, efficiency in the pasture and in the feedyard. A darker, smokier shading is often evident around the shoulders and neck compared to the rest of the body. The switch of the tail is dark brown to black. The skin is pigmented, the muzzle is black, and the hooves are dark and very hard.